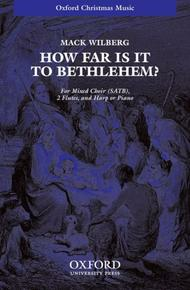 How far is it to Bethlehem? composed by Frances Cheserton. Arranged by Mack Wilberg. For Mixed Choir (SATB), Flutes, and Harp or Piano (2 flutes (opt, 2 oboes), harp, strings). Mixed Voices. Sacred, Christmas. Octavo. 12 pages. Duration 4'. Published by Oxford University Press (OU.9780193864252).ISBN 9780193864252. Sacred, Christmas.For SATB, 2 flutes, and harp or piano OR SATB, 2 flutes, 2 oboes, strings, harp or piano. A charming arrangement featuring flutes, this is perfect for even the smallest of choirs.